Tx Scrapper Mom: What's This? What's This? A Nightmare Before Christmas MINI blog hop! What's This? What's This? A Nightmare Before Christmas MINI blog hop! Its Time! The Holidays are fast upon us, and so we had to have a mini hop to show our love for "The Nightmare Before Christmas!" 24 hours long and ends PROMPTLY at 11:59 PST tonight! There are 8 in total. 2- Leave a comment on each blog to show some love for the inspiration you have just seen! Remember 8 stops, so that means 8 comments in total! I chose Ooogie Boogie for my project, and he was just so cute all by himself that I decided to make lollipop holders out of them. Now, a about a dozen more to go, and my first grade class has Halloween Treats :). The sentiment is from Too Cute to Spook. I'm super excited for this blog hop. Nightmare Before Christmas is my daughter's favorite movie. Thanks so much for doing this. All the kids will love him! I just died!! Eeeek, totally love them!!! Great job on the lollipop holders! LOL, how cute are they! Your Oogie Boogies are so cute!! Very cute oogie boogies!! Wonderful project! Just gorgeous .. Love them! Darling! Your first graders will LOVE them! Jack & Friends are truly unappreciated. You make them look so cute. Thank You!! Oogie Boogie is awesome!! I don't know who he is (really have to watch the movie now), but he is a cutie!! This is so cute. Love to see what all you make. HAPPY BIRTHDAY ANN!!!! Keep up the great work ladies. Thank you! Logic Boogie look awesome! What a great idea to turn them into lollipop covers. Will have to do this for my daughter's volleyball teammates. Such a cute treat and awesome idea! What a great class treat! i have no idea who Oogie is but he is cute! thanks for sharing! this is perfect to use for my grandsons! Oh Oogie Boogie!!! Super cute and gross! Great job on the oogie boogie! Thank you for sharing! Too cute… love the lollipop holders!! Your students will love him! This is my daughters second favorite one from the movie. Very cute project! well, I was wrong! I can use the word cute here! Love it. The Oggi Boogie man! LOL I love this! Can't go wrong with lollipop covers and these are precious. now they don't look scary at all! love your Ooogie Boogies adorable! I love your Ooogie Boogie man. Very cute! Now these two are cute!! Super cute! I need to watch the movie again, I don't remember him. Ohh my ...this is just so cute, great job! your class is very lucky. These are really great. So funny the Ooogie Boogie. Love it! Love that Oogie Boogie man!! Cute! I love candy wrappers and this lollipop holder is super cute! Great idea, I love the variety of projects in these swaps! they are so going to love these special, adorable treats - lucky kiddos! How cute, gray job and thanks for sharing!! So cute. They will love it! Cute with a drop of scary! He makes an adorable lollipop holder!! great gift ideas, so cute! What a cute project for 1st graders!!! This will certainly be loved by 1st graders! Good job! 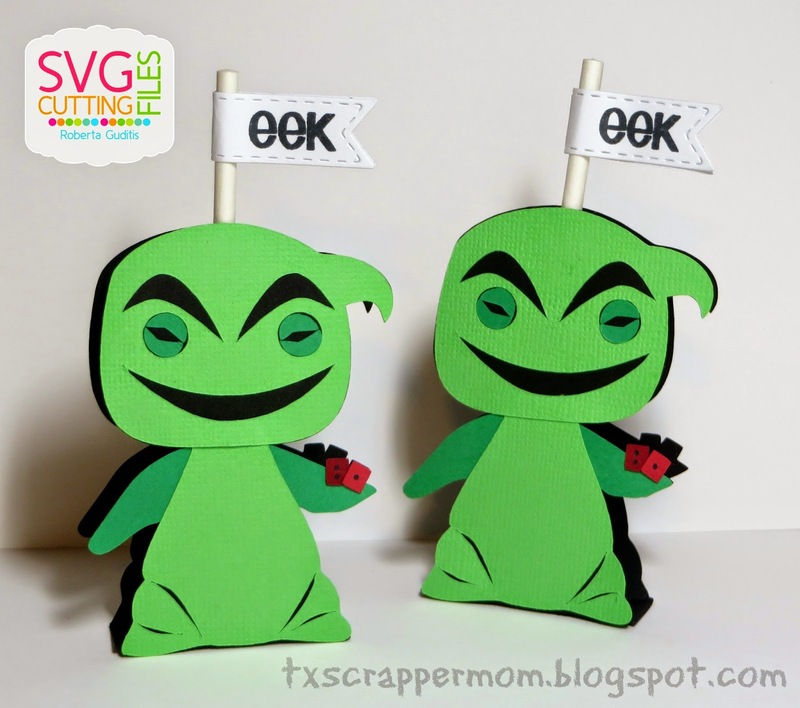 I bet those 1st graders will scream with joy for Oogie Boogie! I like him too! LOL! Oogie Boogie is one of my favorites, the treat box is awesome!